David Ellison captured this image of the Horsehead and Flame Nebulae from his backyard in Chattanooga, Tenn. The image was sent to SPACE.com Nov. 28, 2013. 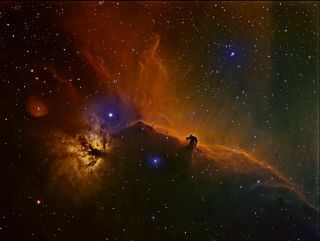 The iconic Horsehead and Flame nebulas paint the night sky in this beautiful image recently sent to SPACE.com. Amateur astrophotographer David Ellison captured this image from his backyard in Chattanooga, Tenn. Located approximately 1,500 light years from Earth in the constellation Orion, the Horsehead Nebula is simple to spot due to its unique shape resembling a horse's head. A light-year is the distance light travels in one year, or about 6 trillion miles (10 trillion kilometers). The Horsehead Nebula is also called Barnard 33 in emission nebula IC 434 and is part of a large, dark molecular cloud. It was first spotted in 1888 by astronomers at the Harvard College Observatory, who imaged the nebula using a telescope and photographic plates.